They already have an impressive garage. 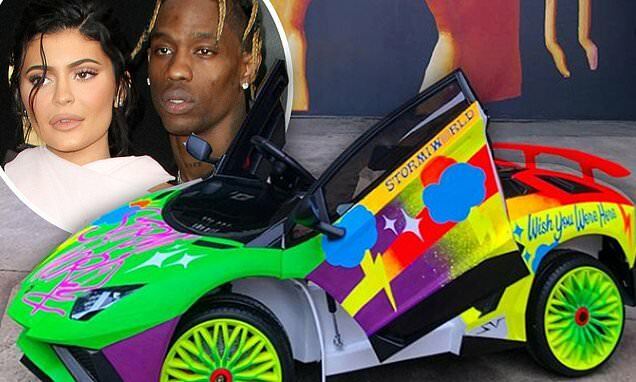 But Stormi Webster received her very own set of wheels during Travis Scott's Astroworld-Wish You Were Here Tour 2 stop at the Barclay's Center in Brooklyn, New York, on Saturday night. The one-year-old received a custom neon Lamborghini with her name on the license plate as it was revealed that her 21-year-old mom Kylie Jenner officially claimed the title of youngest self-made billionaire of all time, according to Forbes. The miniature luxury vehicle was hand-painted by Andrea von Bujdoss, a New York-based artist who is known for her graffiti and impeccable typography. She used blacklight paint to create a cosmic design that glows in the dark, with electric yellow rims and a bright red bumper. Adding even more tiny details to the miniature car, Andrea created a license plate that said 'STORMIW3B'. The little lambo will fit in nicely at her family's garage, with Kylie Jenner already owning a bevy of the luxury vehicles. Travis' 54-show tour began in November and ends later this month with a final stop in Tulsa, Oklahoma on March 26. The vibrant, carnival-themed events have been a massive success for the Sicko Mode rapper, with millions reported in revenue and hundreds of thousands of concert tickets sold. Travis' banner year also included a performance at the half time show during Super Bowl LII in Atlanta, Georgia on Feb. 3.